We at Solid Documents are taking a small step to help cut the burden of rising education costs by making software free to students and their instructors. 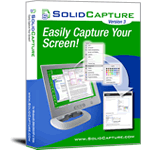 Solid Capture is very useful to students who need to use screen shots and browser captures to extract information or illustrate reports. Companies also benefit in many ways. All companies rely upon well-educated employees and customers who can understand and use technology, so it benefits everyone to support students in their endeavors to receive the highest quality technology education possible. For a limited time, we are offering Solid Capture free to any e-mail address that ends in an educational institution extension (.edu, .k12, ac.uk, .sch.uk, etc). Each e-mail address is entitled to download one copy of the program, free of charge. If you have such an e-mail address (or know someone who does), please forward this post to them. Restrictions: the license is strictly for non-commercial use, is non-transferable, and applies to the current release only. Other than that, students and educators are free to use the software for whatever purposes they need. We hope students and teachers will enjoy this offer and look forward to hearing how Solid Capture is being used in educational institutions throughout the world!